On September 27th Ringmaster Festival will open it's gates for the first time and are pleased to announce their Friday schedule, which will serve as a taster to the main spectacle of Saturday's line up. Friday will see Dry The River as headliners, along with performances from Dan Croll, Night Engine, Flyte, Dancing Years and a local opener, selected by Dry The River. 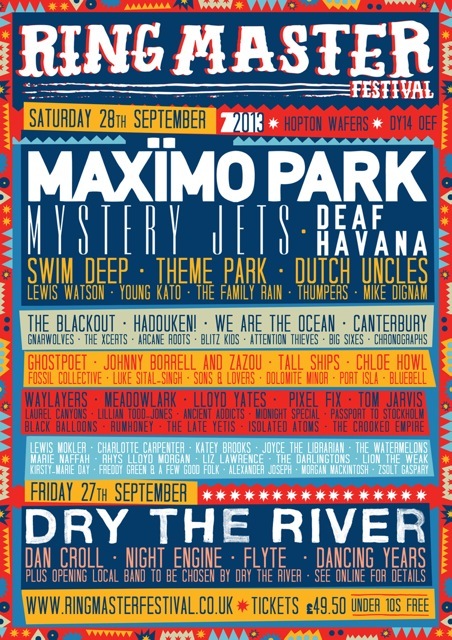 Saturday brings along Maximo Park, Mystery Jets, Deaf Havana, The Blackout, Hadouken!, We Are The Ocean, Ghostpoet and Johnny Borrell & Zazou, as well as some of the UK’s finest rising acts like Swim Deep, Lewis Watson, Theme Park, Thumpers, Luke Sital-Sing and Chloe Howl, whilst Gnarwolves replace Dinosaur Pile-Up. Saturday will also see the signing tent come to the action, where fans can will be able to meet bands and see acoustic sets from the likes of Deaf Havana in a 150 capacity environment. Originally planed as a one-day event, the now two-day festival takes place at Hopton Wafers, in the stunning Hereford & Worcestershire countryside. This year’s Ringmaster will home big top tents with the look and feel of a vintage circus but with a focus very much on music. With a shared vision and ethos of celebrating creativity in all forms whilst supporting the next generation running through from the festival founders and all the extended staff Ringmaster will be donating a share of £5 per ticket to their two chosen charities, Barnardo’s & Longlands Care Farm. The festival will also be supporting the local area by using local food produce. Other acts set to play this year are: The Xcerts, Young Kato, The Family Rain, Arcane Roots, Fossil Collective, Tall Ships and Sons and Lovers, plus many more..